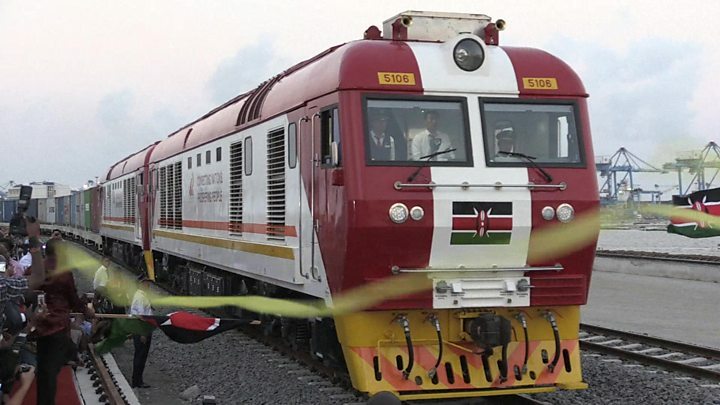 Two senior Kenyan government officials have been charged in court with fraud over the building of a $3.2bn (£2.5bn) Chinese-funded railway line. The two are accused of paying more than $2m in compensation to private firms which falsely claimed to own land through which the line ran. The officials and 15 other accused have pleaded not guilty to the charges. The railway line was Kenya’s biggest infrastructure project since independence from the UK in 1963. President Uhuru Kenyatta opened it in May last year, hailing it as a new chapter in the East African state’s history. 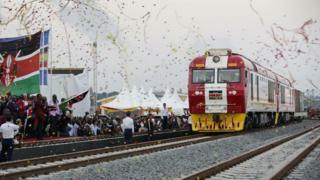 The line runs between the port city of Mombasa and the capital, Nairobi, and construction was completed 18 months early. It is supposed to eventually connect landlocked South Sudan, eastern Democratic Republic of Congo, Rwanda, Burundi and Ethiopia to the Indian Ocean. But the project has been marred by corruption allegations, and claims by economists that the cost was too high. It ran up a loss of about $100m in its first year of operation, official figures show. The project was also condemned by wildlife groups as the line runs through the Tsavo National Park in south-eastern Kenya. Kenya Railways head Atanas Maina and National Land Commission chairman Muhammad Swazuri were charged with fraud on Monday, following their arrest on Saturday. Many Kenyans have welcomed the detention of the two men who were seen as “untouchables” because of the political influence they wielded, reports the BBC’s Ferdinand Omondi from Nairobi. They were handcuffed after they took their seats in the dock at a magistrate court in Nairobi. The directors of several companies are among the 17 accused, our reporter adds. They all denied the charges. The arrests are the latest sign of the government intensifying its campaign to end the culture of impunity in Kenya, our reporter says. The government has demolished several landmark buildings in Nairobi in the past week, and hundreds more are being targeted in a drive to reclaim public land. Speaking during a church service on Sunday, Mr Kenyatta said: “Over the last few weeks I have lost so many friends.